On April 2, Armenians and Azerbaijanis marked the second anniversary of the outbreak of heavy fighting now known as the “April War” or “Four-Day War,” in which at least 200 died in the worst bloodshed since the two sides signed a cease fire in 1994. The two sides took the occasion to blame each other for the violence and to reiterate maximalist claims, suggesting that lasting peace is as far off as ever. Azerbaijani Foreign Ministry Spokesman Hikmat Hajiyev tied the commemorations with another anniversary, 25 years since Azerbaijan lost the strategically vital Kalbajar district on April 2, 1993. 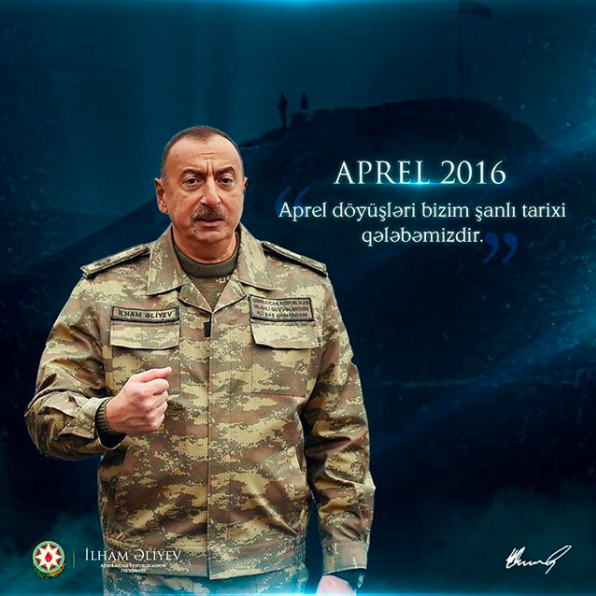 President Ilham Aliyev, for his part, posted an image on Instagram of himself wearing military fatigues with the caption, “The April War was our glorious historical victory.” It was ostensibly posted from Lala Tepe, a bit of land that the Azerbaijanis conquered during the fighting, the first time any territory had changed hands since 1994. Some Azerbaijanis used the anniversary to promise more territorial gains. “Azerbaijan’s military victory in 2016 has once again demonstrated that Azerbaijan has a powerful army capable of liberating its occupied territories,” Azerbaijani MP Bakhtiyar Aliyev told Trend. He went on to argue that the Armenian side has been “creating myths” about its military capabilities, but that the 2016 conflict exposed limitations in Armenian capabilities. “If [we can’t achieve peace through negotiations], there is a mighty Azerbaijani army. According to assessments by international organizations and experts, Azerbaijan has a strong army and equipment,” the MP said. Meanwhile, at an arms exposition in Yerevan, at which Armenia showed off its own progress in the weapons industry, visitors were shown a live feed of the line of contact with Azerbaijan.